Full size, compact gasoline or diesel technology is available in Kubota's ZTR mowers. Kubota continues to add to its line of zero-turn-radius mowers to include both full size and compact models available with Kubota gasoline and diesel engines. The latest addition is the ZG332, the company's most powerful gasoline ZTR mower with a 32.5 horsepower liquid cooled Kubota engine, hydrostatic transmission and Pro Commercial mower deck in both 60- and 72-inch options. In addition to the boost in power, the ZG332 holds 13 gallons of fuel for extended work sessions. The 300 Series also has a 21- and a 32-hp. diesel powerplant choice for long life and fuel efficiency. The new ZD221 from Kubota offers light maneuverability and superior navigation, along with efficient diesel power. For tighter work spaces, Kubota's new Z200-Series is equipped with a compact chassis and a lower-center of gravity for good maneuverability and navigation. The ZD221 comes with a 21 hp. 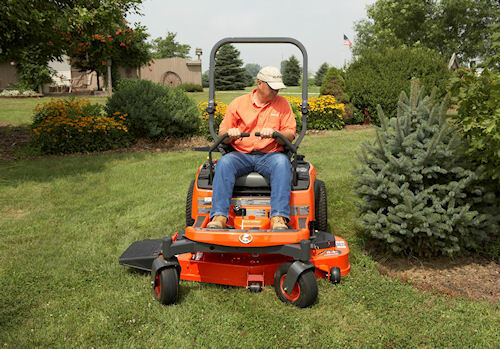 Kubota diesel engine and is available with 48- or 54-inch Pro Commercial Mower Decks. Gasoline models in the lineup include the ZG222 and the ZG227, powered by 22- and 27-hp. air-cooled Kubota gasoline engines respectively. For more information on the new Kubota mowers, visit www.kubota.com.